306 pages | 3 Color Illus. | 184 B/W Illus. 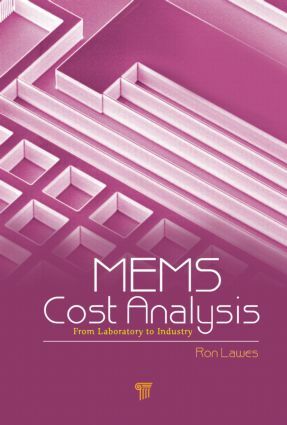 This volume demonstrates show cost analysis can be adapted to MEMS, taking into account the wide range of processes and equipment, the major differences with the established semiconductor industry, and the presence of both large-scale, product-orientated manufacturers and small- and medium-scale foundries. The content examines the processes and equipment sufficiently for the reader to appreciate how costs arise. It examines representative costs are examined in sufficient detail and accuracy for specific equipment, processes, products, or foundries to show how financial models can be introduced to estimate the cost and price for a MEMS product. The World of MEMS; Chapter 2: Basic Fabrication Processes; Chapter 3: Surface Microengineering. High Aspect Ratio Microengineering; Chapter 5: MEMS Testing; Chapter 6: MEMS Packaging. Clean Rooms, Buildings and Plant; Chapter 8: The MEMSCOST Spreadsheet; Chapter 9: Product Costs – Accelerometers. Product Costs – Microphones. MEMS Foundries. Financial Reporting and Analysis. Conclusions.